I recently attended the @eSAXnetworking event held at the Horticulture Building at TD Place on Bank Street. This was my first time attending this recurring event, so I went into it uncertain of what to expect. I have to say that overall, I was very impressed with both the professionalism and the truly elegant feel of the event. They spared no expense to create a dynamic, exciting, and enriching atmosphere to promote social and business networking. Jarrod Goldsmith is the brains and creator behind eSAX and did a phenomenal job of organizing this event and bringing together the business community in a unique and interactive way. The Horticulture Building, @lansdowneprk since being restored and modernized, is an eclectic place to hold networking events. The open concept of the building allows for multiple layout options, while the utilization of curtain/temporary walls offers flexibility in creating an open and inviting space. As soon as I approached the venue from the outside, I experienced the excitement of the activity, the colour and lights of the booths, the people and the impressive décor going on within. It gave me a feeling of excited anticipation about what was to come beyond the entrance. The setup of the event was highly conducive and advantageous for networking in the main area, while offering a spacious secondary area to host the guest speakers and entertainment towards the rear of the building. With a bar to one side at the front of the building and the food service tables on the other, the atmosphere was very welcoming and encouraged people to spend some time mingling. The tall bar tables allowed space for this, as well as a place to sit and enjoy a drink or a snack. 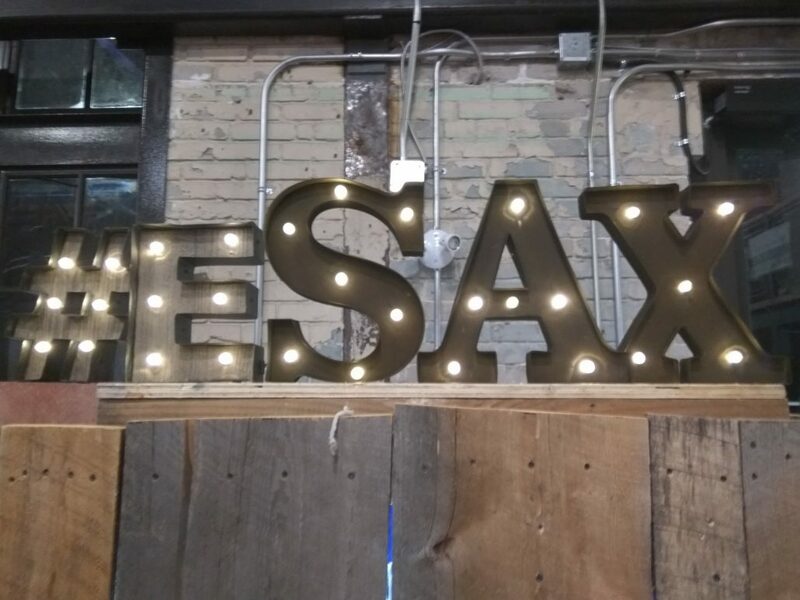 The addition of a photo wall featuring the eSAX logo added a glamorous feel to the room, where attendees could relish the celebrity experience of walking in on the “red carpet” (black and yellow in this case), as if at the Oscars. I enjoyed the idea of the signature “SAX on the beach” drinks that they were serving in tall martini glasses as well as featuring their own wine. It was a classy touch and provided a fun topic of conversation for the attendees. The food was catered by @PitaPitOrleans/ @pitapitkanata (Pita Pit), which has been a favorite of mine since my old club days in the Byward Market. I really appreciated the offering of both vegan and gluten free options to cater to attendees with food allergies and dietary preferences. That’s always a nice touch and really goes a long way with the people for whom it affects. Although I didn’t count the individual booths, I’d estimate that there were approximately twenty different companies in attendance showcasing their products; the majority focused on marketing strategies and business to business (B2B) contact management. As to be expected at an entrepreneurial trade-show, each booth was bustling with activity leading up to the speaker’s presentations. As a first time attendee, I was happy to see the interest in these products and although not as applicable to my business strategies as others, I genuinely appreciated the effort that these companies put forward to market their products in the B2B environment. I’d like to give a shout out to King’s Lock Craft Distillery (www.kingslockcraftdistillery.com) who set up a booth to showcase their liquor. As a Rye drinker, I can recommend their clear Rye, which they distill locally. I had the pleasure of speaking with them, and was excited to hear that they are currently aging a batch of local Rye to test on the market. You can purchase their products at their distillery, located south of Ottawa in the Prescott area (see their website for details); hopefully it will be available at the LCBO in the near future. The lineup of speakers was equally impressive as the location and trade-show. Again, as a newbie to an eSAX event, I didn’t know what to expect, but with keynote speakers such as @JimWatsonOttawa (Mayor Jim Watson), @BobUrichuck (Bob Urichuck) and @ProfBruce (Bruce Firestone), with @dylanblackradio (Dylan Black) as the Master of Ceremonies, I was not disappointed. I was particularly impressed with Mayor Watson’s promotion of local businesses as he took the time to highlight some of the events coming up in the Ottawa area for #Ottawa2017, and the potential benefit local businesses. He also spoke in some detail about the newly founded (and funded) Innovation Centre located on Bayview in the Mechanicsville area. When I first arrived, I ran into an old friend of mine right away, a Stormtrooper. There’s just something about Star Wars; even if you don’t appreciate the series, you can still recognize and appreciate the familiar characters. Hiring people to dress up as Star Wars characters will never disappoint, and always makes for great conversation and photo opportunities. After about half an hour, my Stormtrooper friend was joined by his “boss,” Darth Vader. As they made their rounds together, the Empire was well represented. A creative idea that was enjoyed by everyone in attendance was the Mannequin challenge at 8:00pm. For those of you who are not familiar with this trending idea, it basically consists of a group of people who remain absolutely still (hence “mannequin”) for a period of time in silly or unique positions, while a videographer makes the rounds. It isn’t that different from the whole flash mob (meets the Harlem Shake) concept that showed up all over social media about five years ago, but it’s still interesting and fun. It took about as much effort as expected to organize a few hundred people through multiple announcements and direction being projected over the bustle of trade-show. I think herding cats would have been easier, but after about five minutes of effort, the crowd was cooperative and froze for nearly ten minutes while the camera operator passed through each section of the room. This video will be posted on YouTube in the future, but I am not aware of the details at this time. I have to say that there were some very talented people in the room (at least in the direction I was facing), who held their positions very well, including the organizer, Jarrod, who was able to freeze his outstretched arm holding a microphone for the entire ten minutes. I can only imagine how sore his shoulder must have been towards the end. The band, as predicted by the event name, was a very talented saxophone ensemble. I can appreciate the saxophone, as I played a tenor in high school and learned to love the sound. The stage set up was appropriate, and the acoustics in the room allowed for a great show. If you appreciate the smooth sound of the saxophone, I recommend looking them up on YouTube, searching for “Sax Appeal”(be careful of typos or autocorrect though), or checking them out at www.saxappeal.ca or, @SaxAppealOttawa. Given these details as outlined above, I would highly recommend this popular event to anyone interested in the entrepreneurial and business community. It had the feel of a social ‘gala’ to a certain extent, so even if business isn’t your forte, mingling and socializing with new people can make for an enjoyable night out. With prices of $50 in advance or $65 at the door, tickets are very reasonable given the lineup of dignified speakers, the delicious catering, and the high quality and production value of the event.